The British duo release their third LP of spacious electronic attack and decay, fully joining the Raster-Noton roster for a meeting of like-minds at the label showcase at Berghain in Berlin on November 8th. Angus Finlayson investigates. Above: (left to right) James Ginzburg and Paul Purgas. Both members of Emptyset are in possession of seriously intimidating CVs. James Ginzburg runs the Multiverse publishing house and family of labels—a hub for Bristolian dance music culture since the glory days of dubstep—while his musical accomplishments include co-authorship of Joker’s purple dubstep anthem “Purple City”, as Ginz, and a recent album of folksy acoustic music as Faint Wild Light. The Bristol-raised, London-based Paul Purgas, meanwhile, works as a sound art curator, bears partial responsibility for excellent under-the-radar techno night Bodyhammer, and runs We Can Elude Control, a semi-regular night and nascent label exploring the intersection of sound art and music. As such, the fearsome focus of the duo’s collaborative project might come as something of a surprise. Initially a vehicle for techno 12”s in the minimal, post-Sähkö vein, a string of LPs under the Emptyset name have since outlined a highly distinctive back-to-basics aesthetic. Demiurge used the building blocks of studio sound—sine waves, white noise, and feedback—as raw material with which to sculpt visceral music with a formidable utilitarian streak; as Ginzburg put it in an interview with The Wire, this was “the sound of production without any of the content.” Medium, meanwhile, brought those processes into contact with the half-finished architectures of Gloucestershire stately home Woodchester Mansion, resulting in a record of stark geometries and rich negative spaces. The duo’s latest, Recur, brings the themes of its predecessors to their logical conclusion; Ginzburg and Purgas speak of it as the third in a trilogy. Their first LP for Raster-Noton, it’s doubtless their most refined record to date, and while it sees them return to the hermetic confines of the studio, the duo’s complex process-based techniques are yielding more dynamic results than ever. Speaking via Skype from the Multiverse attic studio, Ginzburg and Purgas explained how the album reflects a growing interest in notions of time and causality, and how their ever more cross-disciplinary activities hark back to the “cultural experiment” of an earlier era. The two of you are involved with a multitude of projects across disciplines and styles. Is it satisfying, with Emptyset, to have a project which is so pure? Do you think of it as pure? James Ginzburg: Out of everything I’ve been involved with creatively, it’s the project that has the most coherency. It’s all built around a very disciplined approach. And as such, I’m prouder to have been part of it than the vast majority of other things I’ve been involved in. In the process of putting together the first album, we solidified a set of very elemental ideas and approaches, which have given us a means to progressively develop and explore an idea within a very contained universe. And I think that has made the entire process feel like a unified whole. Every single gesture within that has felt like it’s in conversation with the initial proposition. Paul Purgas: Within other artforms—architecture, painting, photography, or whatever— this idea of working fundamentally with form, material, structure has a significant history. For us, it was about applying some of that criticality and some of that rigor to working with sound. I think that was our intention. This initial proposition you’re talking about—was it there from the very beginning, from the early 12”s, or was it something you uncovered? JG: When we started the project, at least for the first two years, it was fundamentally a process of me and Paul getting to know each other, and developing some kind of creative rapport. We initially tried to do that within the confines of club oriented music—by making 12” records, techno records. But something about it just didn’t click. When we gave up on that as a way of working together—almost to the point of considering not working together—that allowed us space for something that was, perhaps, a step beyond or a step sideways from that. PP: It was also a territory that allowed us to bring a lot more of our interests external to music into our working relationship. So it ceased to be about us producing records in a traditional sense, and it became more about developing a project which could become a meeting point for of all our external interests—literature, visual arts, cinema, art history. I wanted to talk about Medium. It’s the record that put you on the map, more or less. But while you’ve talked about the music you make in Emptyset as being “the sound of production with no content,” that album was recorded in this half-constructed stately home, Woodchester Mansion. So suddenly there was an evocative narrative people could read into the music.You used the same method for the Material EP, where you selected very poetic locations—a decommissioned power plant, for example. Do you invite poetic interpretations of those records, or do you consider that to be a misreading? JG: In our minds perhaps we’ve split our musical exploration into two different threads. One is very much looking at contained and controlled studio processes. And one is taking those processes and extrapolating them out into other mediums and situations. When you take something out of the controlled studio environment the conversation immediately broadens, and every aspect of that conversation has to be considered. To say poetic is, in terms of our intention, maybe a bit grandiose. But it’s certainly an invitation to engage with every aspect of the project. PP: One of the things that’s been most exciting about the project has been finding ways of taking these processes that we’ve developed in this room [the studio], and taking them to external environments, different contexts. Thinking, with both of those [releases], how there can be a relationship between sound and architecture which can play or interact with narrative, but still leave a certain degree of space for the listener to engage with it on their own terms. But I think in terms of choosing the sites there was always a set of considerations. There had to be a conversation between the issues of time and scale that were being proposed through the music [and the building]. So it was specifically about finding sites that could be in a dialogue with what we were producing. Which of those two strands does the new album belong to? Is it a return to studio work? JG: Well everything that we’ve done since the first LP has been part of a continuum. But it is much more clearly connected to Demiurge, our previous album [before Medium], and the Collapsed EP we did for Raster-Noton at the end of last year. In this particular album we’re focusing much more strongly on the idea of time. There were [also] developments in our studio processes and practice. We worked on much of [the album] in another studio outside of Multiverse with a large console. Which allowed for much more complicated processes to be set up, but also the ability to interact with those processes in a much more intuitive, hands-on sort of way. When you say time, are you talking about working with quite rigorous, almost mathematical patterns of durations? Or was it more improvisatory? JG: We generally have quite static and regimented ideas of time when it comes to music. Coming from the point of view of popular music or dance music, what we think of as music is measures with a time signature, repeated—like a clock that runs through an entire piece. But instead of thinking about measures and repetition we could think about events and causality. So for example, imagine you had a minefield, and one mine was set off, and that set off another one, and that set off several. You have an event, the explosion, then a causality which is a very dynamic and complicated system. You could think of that as a rhythmic sequence of some kind. And all of a sudden you have a different relationship to what you perceive music to be. Paul, you’re very involved in the contemporary art world. And you guys seem to play in a contemporary art or gallery context almost as much as you do a gig or club context. How does being on that circuit influence what you do and how you present yourselves? 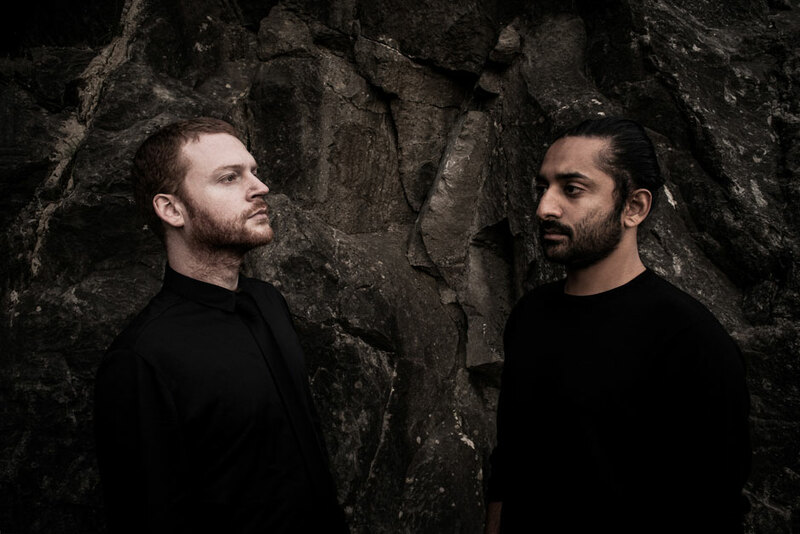 Emptyset’s Recur is out now on Raster-Noton. The Raster-Noton showcase featuring Emptyset, Diamond Version, Frank Bretschneider, Atom TM, and more takes place at Berghain on November 8th.